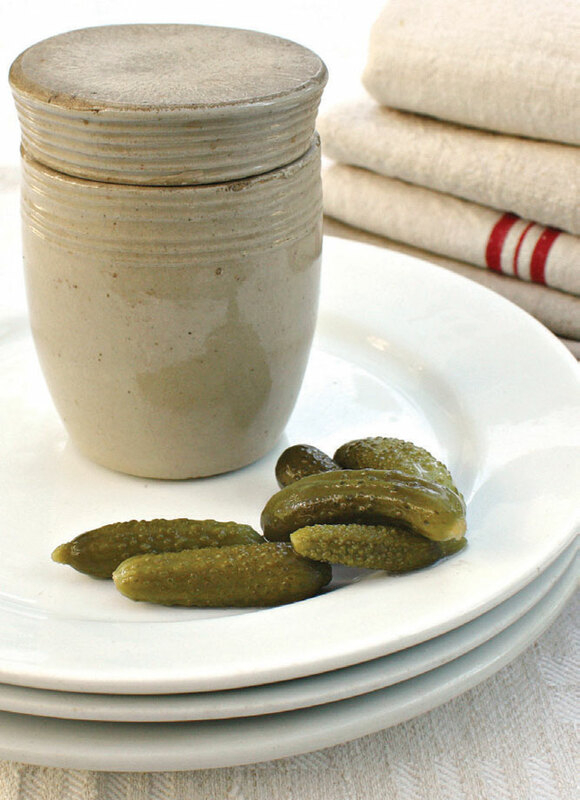 Add French country flair to your home with these culinary collectibles. 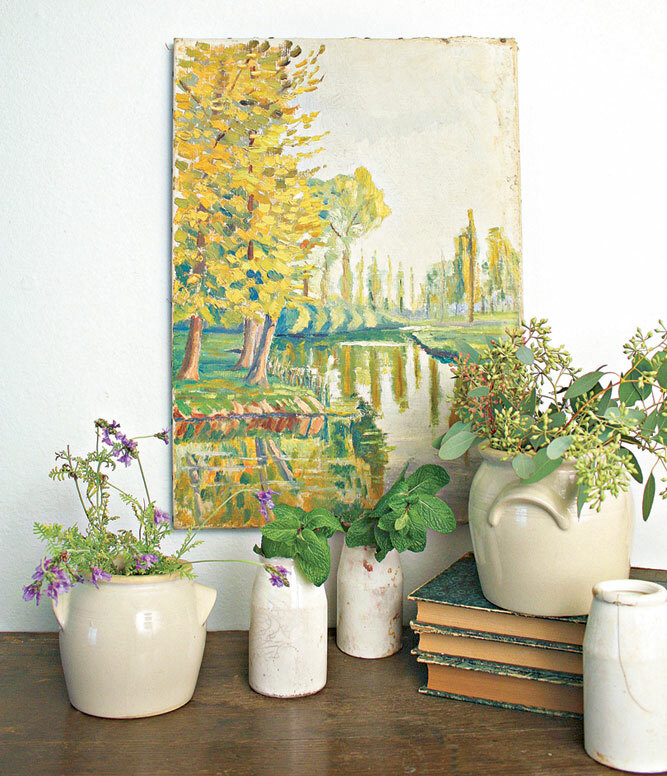 Add French country flair to your kitchen with culinary antiques. Most of us have warm memories of cooking and baking; the kitchen is often our very favorite room in the house. 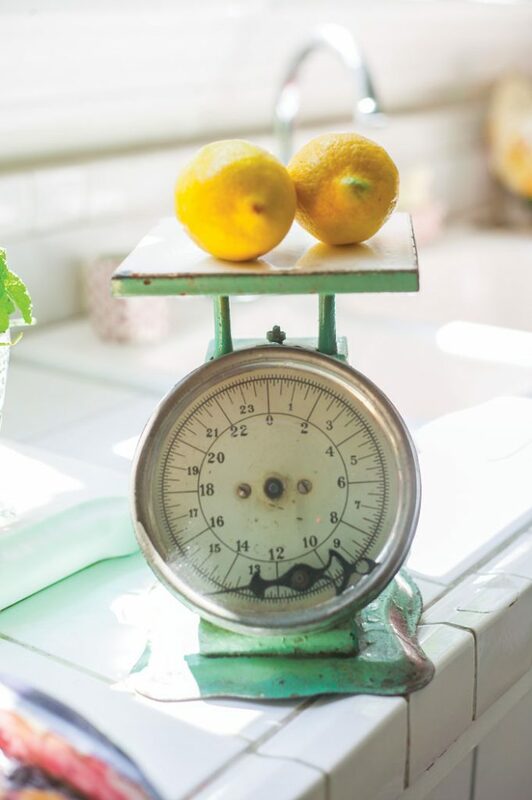 Because of renewed interest in cooking and entertaining at home, culinary antiques are becoming some of the most sought-after by collectors. 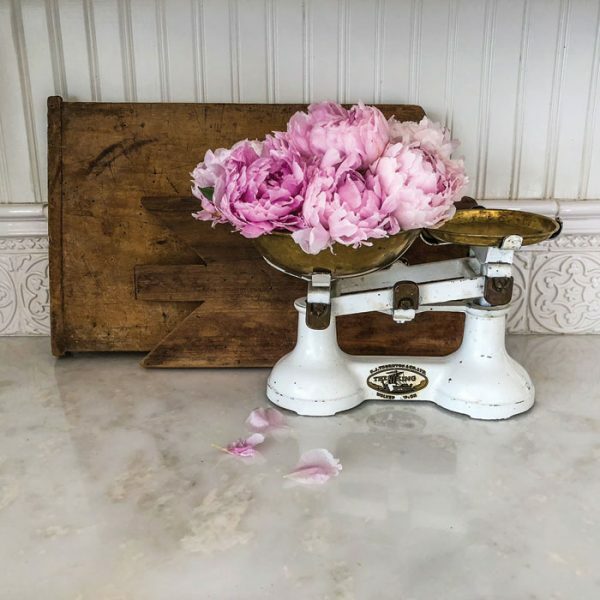 French country culinary antiques appeal to younger collectors in particular, who love how 19th-century artifacts complement their farmhouse-style kitchens. 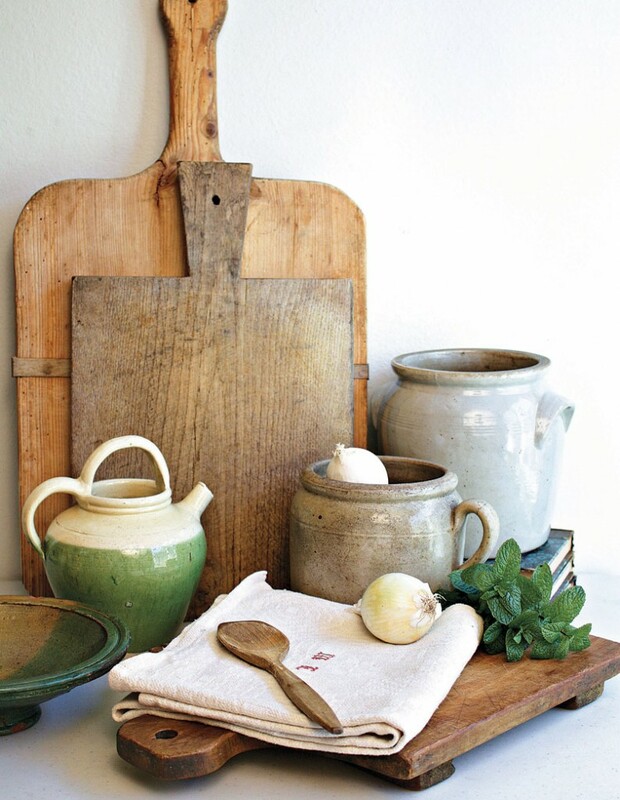 These simple country antiques connect us to a time when we all allowed for leisurely food preparation, and dining was an event. 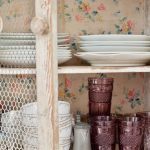 Many collectors fill their homes with French country kitchen antiques to remind them to sit and enjoy lovingly prepared meals with their family and friends, treasuring their company. Collecting kitchen antiques is based partly on knowledge, but mostly on love. 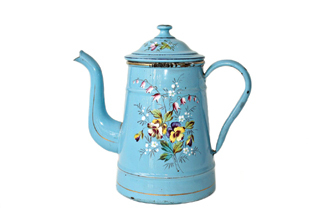 There are many different types of French country kitchen antiques, and collectors generally fall into three groups. Some collect only one thing, striving to find better or rarer pieces. 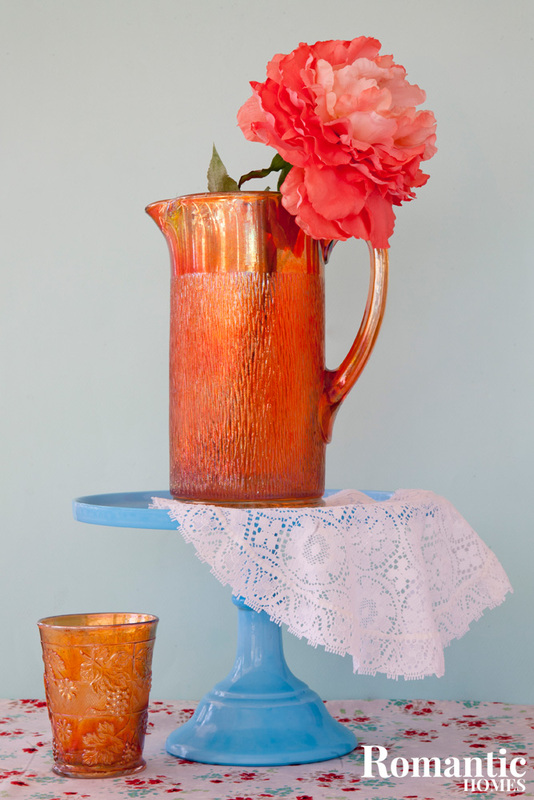 Others collect a category of objects, such as everything made of copper. 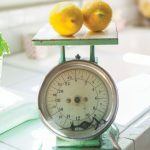 Yet other collectors look for a little bit of everything, either to recreate a country kitchen from the late 1800s or early 1900s, or to decorate their home with pottery, enamelware and other kitchen items from France. Basically, what you collect will depend on what you can’t resist! There is a wide range of French country antiques: enamelware, pottery, dishes, baskets, copper pans and pots, to name just a few. This vintage ceramic strainer not only has an attractive handmade appeal, but it is also a practical piece to use. Country culinary antiques were useful objects and are often collected for sentimental or decorative reasons, so they don’t have to be pristine. Nothing evokes the Provençal countryside more than things that have lost some of their paint and polish. A little chip here and there, a crack; these features show that country kitchen antiques have been used. Many collectors actually prefer pieces with well-worn patina and visible wear. 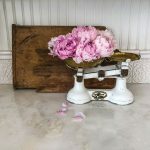 Using French country antiques in your home and kitchen creates a link to a culture and time when every was created with care, by artisans who cared about each detail. Eye-catching, culinary antiques connect the dots of that past to the present. 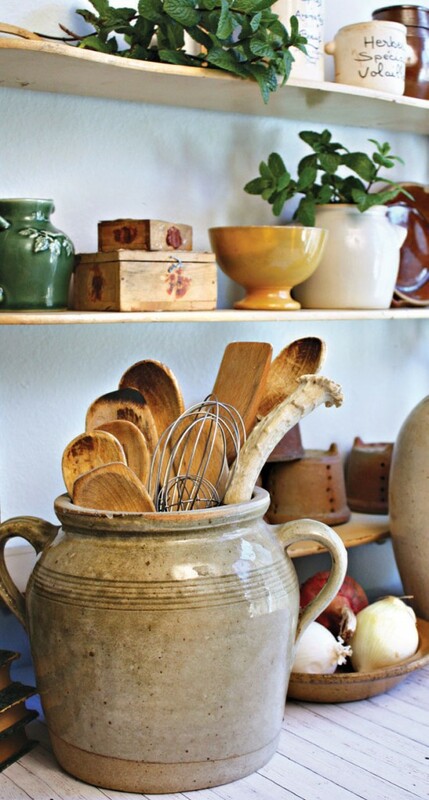 French pottery from the Provence and Alsace regions makes every kitchen speak French. 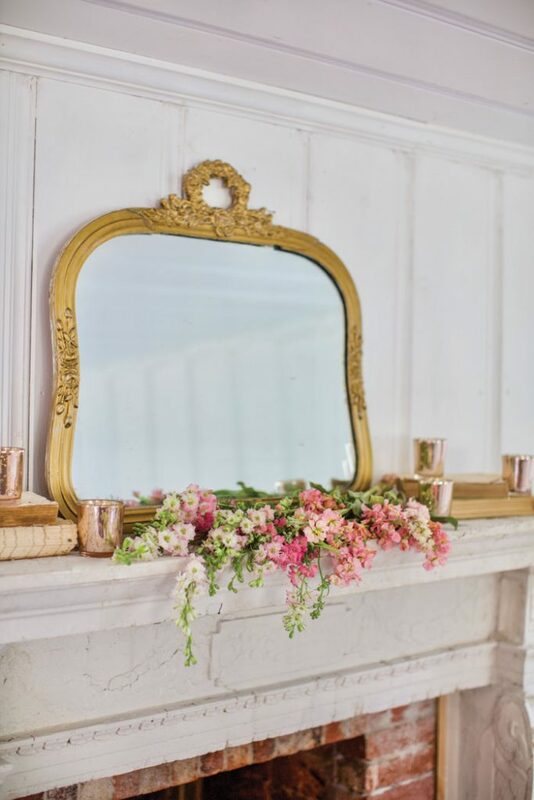 You can use these old treasures to brighten up your kitchen, but they look just as stunning displayed as a piece of art amid a collection of antique books (cooking or not) or as a centerpiece holding a handful of flowers or herbs from your garden. 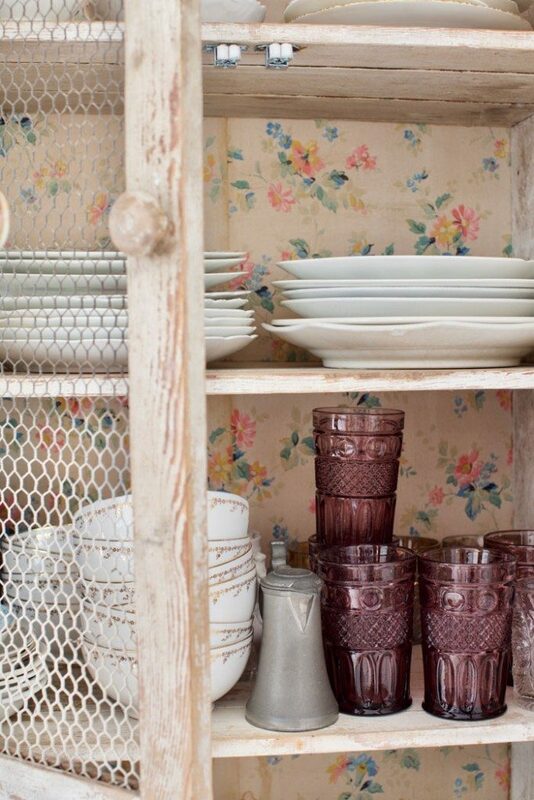 Antique kitchen or tableware is meant to be enjoyed, used and shared. These pieces are precious but were made to be hardworking and sturdy. They are not just relics of the past, so please don’t be afraid to use them! Collecting kitchen antiques is based partly on knowledge, but mostly on love. These antiques represent a lifestyle in the past that we long for, one that embraces time spent in warm kitchens creating special foods to feed those we love and taking the time to enjoy meals with treasured family and friends. For more on Lidy Baars and French country collectibles, visit French Garden House Antiques. 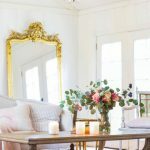 Your checklist for antique farmhouse decor. 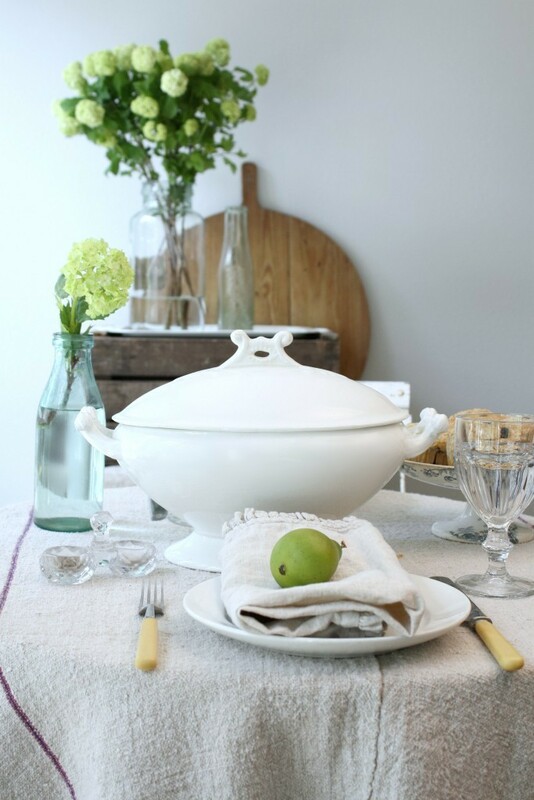 An ironstone tureen and vintage linens complete the rustic yet chic tablescape. 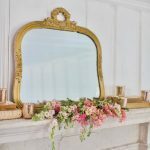 Welcoming, unpretentious and very livable, farmhouse style is an alluring way to decorate your home with antiques that have history, stories and meaning. Gaining momentum as a favorite design style, the farmhouse aesthetic is a charming mix of rustic, country and traditional, and proves that simple style can be quite sophisticated. 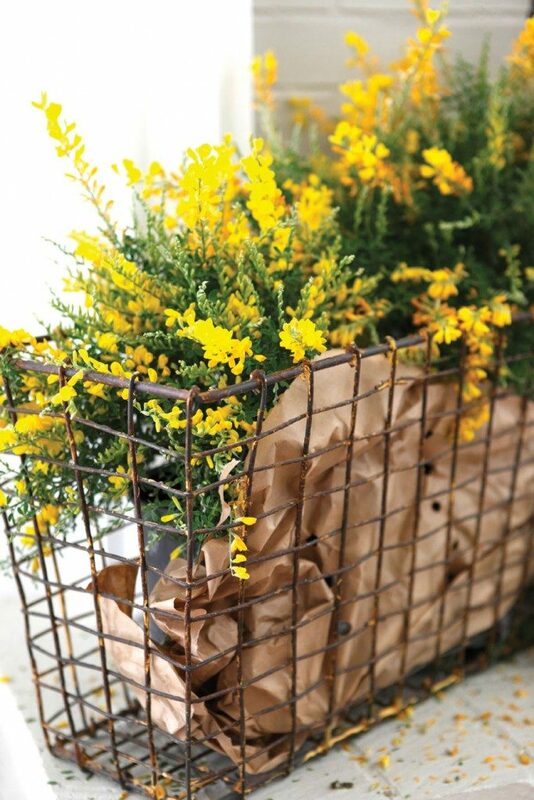 Simple baskets are not only practical, but also strikingly decorative. Look for quality of workmanship, paying special attention to the detail and the weave. An older basket will bear witness to its age and have the rich color of patina and normal wear in the expected places. Antique baskets will often be heavier than their newer counterparts and have wood handles. Avoid brittle baskets and check for repairs; the best investments are baskets in original condition. Linens with red-embroidered monograms are naturally luxurious. 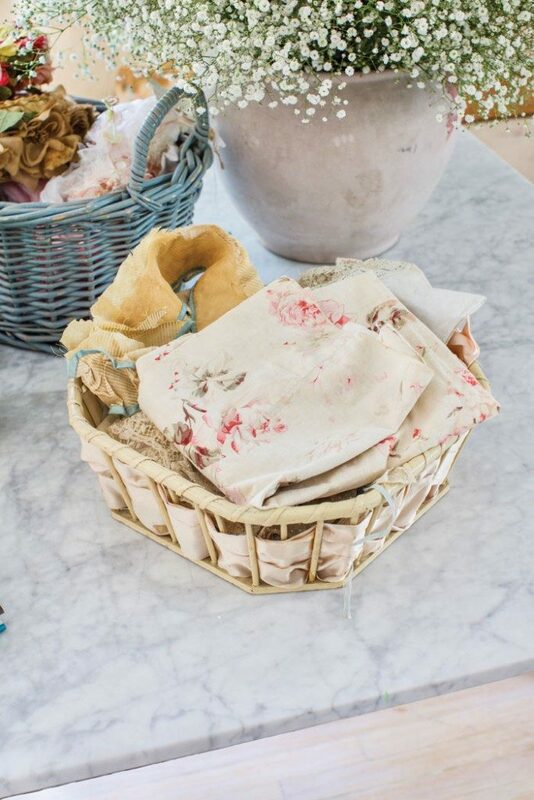 Spun from linen and flax, simple linen tablecloths, napkins, grain sacks and sheets made up every farmer’s wife household linens.With an appealing texture and handmade quality, original antique linens are highly collectible. Look for fabric that has a smooth, soft feel that only decades of washing can attain. Search out unstained, nearly pristine pieces, although a few small spots are to be expected. 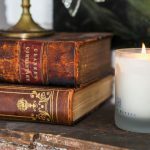 As history is part of the appeal of antique textiles, mends and patches are considered appealing; they tell the story that someone long ago loved and used the linens with care and pride. The simplicity and utility of gleaming white ironstone make it a favorite for the farmhouse aesthetic. Thick and heavy, ironstone is not only decorative to display, but also it is a dynamic part of any farm style table setting. Look for pieces without cracks or chips around the rims. Ironstone pieces are survivors. Their resilience tells their story, so minor discoloration is acceptable, adding patina to their beauty. Most true antique ironstone will be marked on the bottom. Sturdy enamelware, sometimes called graniteware when it comes with a speckled pattern, was a staple in every farmhouse a century ago. Humble coffeepots, canister sets, kettles and pitchers in soothing neutral colors predominate in farmhouse-style kitchens. Look for heavy and substantial pieces that have a thick and glossy finish. Most antique pieces will have tiny lines called craquelure in the finish. Missing pieces of enamel are expected on knobs and handles, but avoid pieces with huge chunks missing or a lot of rust. Farmhouse style combines well with most other décor styles. 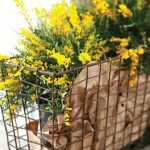 Baskets, ironstone, quilts, enamelware, wooden bowls and antique silver are all accessories that help your home embrace the country charm of farmhouse style. The soothing colors, honest natural materials and age-worn finishes of farm antiques will help bring this rustic lived-in look to your home. For more on Lidy, visit frenchgardenhouse.com. An introduction to history's most whimsical servingware. If you’ve ever been to a flea market or vintage fair, you’ve undoubtedly passed by a glistening piece of carnival glass. Produced from the early 1900s to as recently as 2011, carnival glass is easy to identify thanks to its iridescent finish. Simply put, carnival glass is pressed glass that has an iridescent coating. The glass was poured into a patterned mold, pressed into shape and then sprayed with liquid metallic salts—creating its iconic iridescent coating. This simple process allowed for approximately 2,000 patterns to be made by multiple manufacturers, many of which are very similar and therefore difficult to differentiate. Iridescent finishes were also applied to milk glass and its not-so-distant cousin, moonstone glass. Most collectors agree that Fenton Art Glass Company was the first to produce this collectible, what they originally introduced as “Venetian Art.” The beauty of this iridescent line of glassware caused Northwood Glass Company, Imperial Glass Company, Dugan Glass Company, Millersburg Glass Company and more to make their own versions of the shiny glass. Despite its inexpensive production process, iridescent glass was originally sold for top dollar—but consumers weren’t willing to pay. With diminished value and lack of interest, the glass eventually became commonplace and inexpensive at carnivals, and a profitable market was finally found. 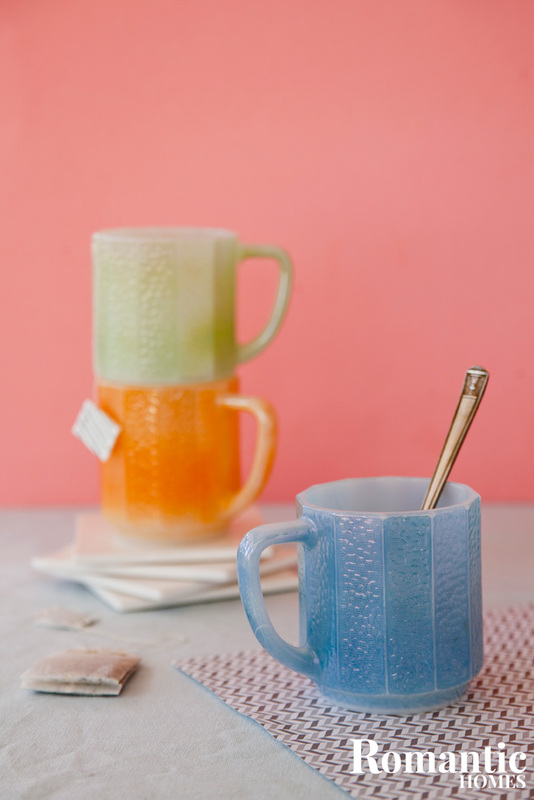 Sold in five-and-dime stores and given away as prizes and promotions in packages of food and household products as well as in local stores, iridescent glass became a beautiful but affordable household item. Competition led manufacturers to develop new colors and unique iridescent treatments. Orange was exceedingly popular. Makers developed their own take or finish, resulting in a range of hues from marigold to peach. Northwood became known for amethyst, cobalt blue, pastels and icy blue and green pieces. Imperial’s biggest successes were purple, Helios (a silver-like finish on green glass), and smoke (an iridescent gray finish applied to clear glass). Red was the specialty of Fenton and experienced the height of its popularity in the 1920s. With the start of the Great Depression, production of iridescent glass halted. It started to become collectible following the end of World War II, when iridescent glassware became commonly known as “carnival glass.” In the early 1960s, Imperial began rereleasing some of its patterns, followed by Fenton in 1970. New patterns emerged, but Imperial ceased production once again in the mid- 1980s. Fenton produced a limited number of items until its closure in 2011. They're a classic way to say "I love you!" What started as the ancient Roman festival of Lupercalia that celebrated fertility has now evolved into a holiday during which one billion cards are sent, according to the Greeting Card Association. But wooing loved ones with cards brimming in cute verses is not just a 21st century tradition—or a 20th century tradition, either. Since the Middle Ages, Europeans have exchanged handmade Valentines, eventually turning over the duty of making cards to factories in the 1800s. You can still collect these relics of romance today! Nothing is more sentimental than a literal piece of history. 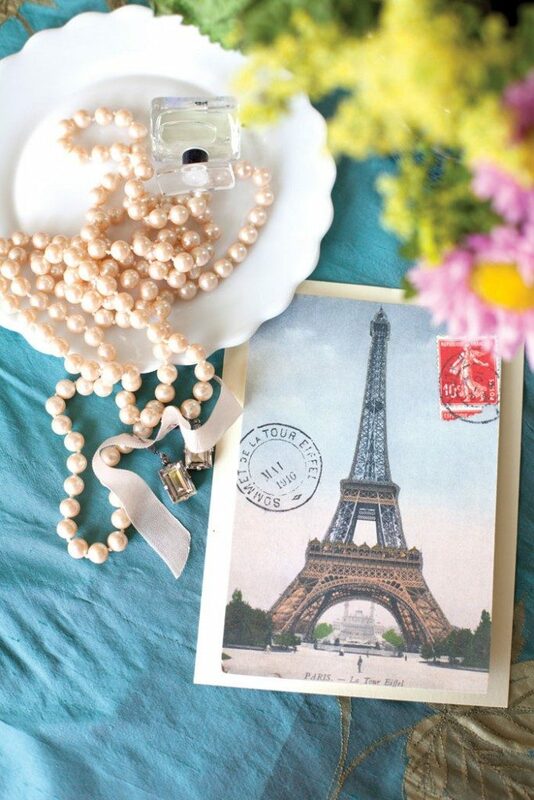 The often elaborate designs on these cards also serve perfectly as vintage decor. Although written verses of ardor had been exchanged in Europe for awhile, Valentines cards really took off in popularity when industrialization hit Britain in the early 1800s, allowing for the mass production of cards. Dwindling postal rates in the 1840s due to the Uniform Penny Post only kindled the printed Valentine’s Day greeting fervor. These factory-produced Valentines started off modestly—they featured black and white pictures, which factory workers painted. 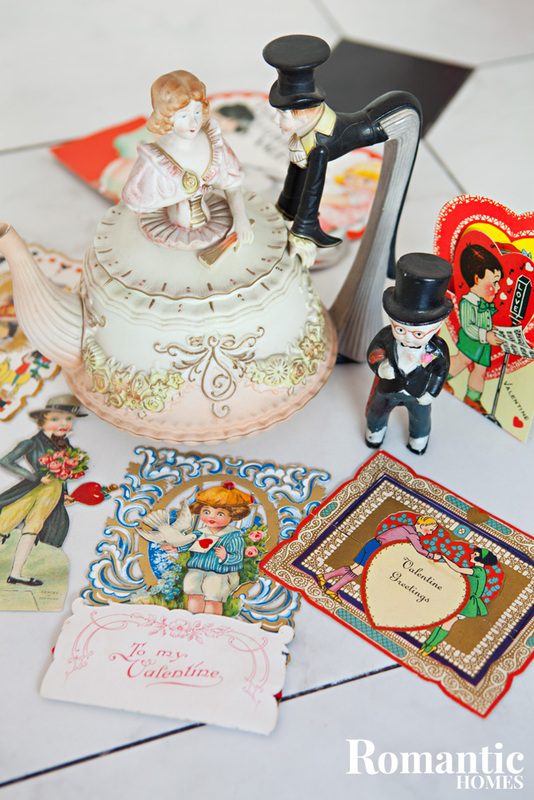 But when Queen Victoria took reign and the Victorian era ensued in the mid-1800s, Valentine’s Day received a new surge in popularity and subsequently more ornate cards. Artwork on these greetings commonly featured flowers, love knots, Cupid, real lace, paper lacework, embossing, ribbons and more: all these materials were referred to as “Victorian scrap.” The traditional folded greeting card that most people exchange today did not take form until offset lithography became a cheaper method for producing Valentines in the late 19th century. But not all cards were a standard rectangular shape: through die-cut techniques, cards were made into shapes like crescent moons and hearts, and sometimes even had characters and shapes pop out. The Valentine’s Day greetings craze transferred over to the United States in 1849 when Esther Howland, an American printer and artist, published and sold Valentines. As one of the first to commercialize Valentines in the US, she became known as “Mother of the Valentine.” Renown company Hallmark Cards sold its first Valentines in 1913—American Valentine’s cards sometimes boasted more intimate artwork than on European card fronts. A quick eBay search for “vintage Valentine’s Day cards” leaves you with an almost limitless offering of old greetings to choose from—with most of them ringing below $10! The same search on Etsy also produces an impressive amount of vintage gems. 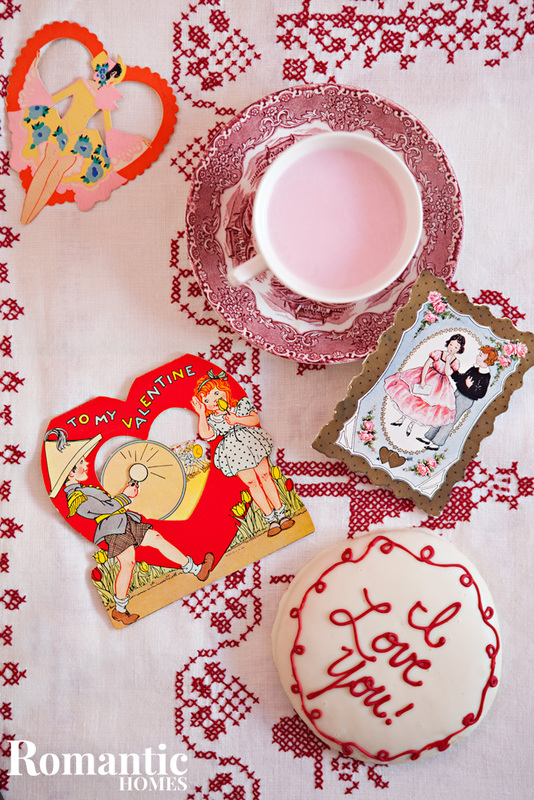 Ruby Lane, an online marketplace for antiques and vintage finds, is another great source for collectible Valentine’s Day cards. 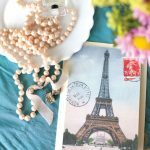 If you are willing to hunt for an especially old greeting card, attend antique shows and auctions! Learn how to avoid a broken collectible and a broken heart with these tips on preservation. Don’t let all the time you’ve invested into piecing together the perfect Christmas tree or dining set go into shambles…literally. Treat your decor and ornaments like the precious pieces they are to avoid a tree or table boasting scratches and chips—especially if the pieces are vintage. Diane Sedo, a featured Romantic Homes stylist and photographer, gave us her tips on how to preserve and store your holiday decor so they’re just as bright, glittery or shiny—and most importantly, in-tact—next year. 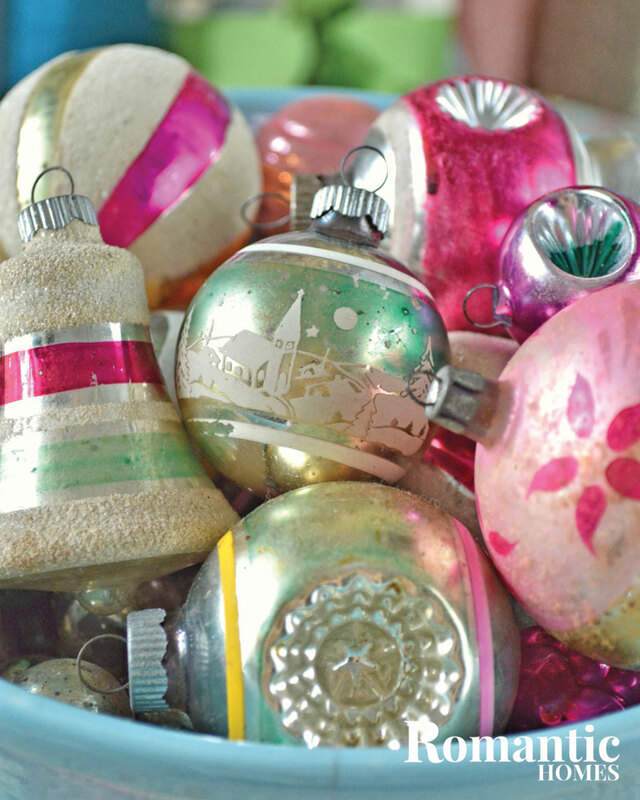 To prevent scratches, always remove the metal hooks from ornaments and store them in a resealable storage bag. 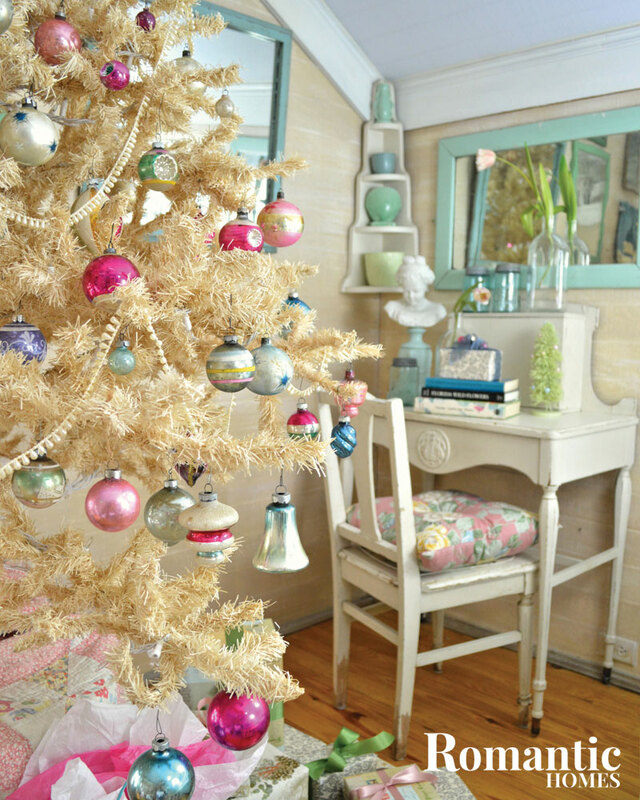 Dust your ornaments with a feather duster or soft artist’s brush. “I store components of vignettes together so I don’t have to search through boxes to put them together again,” Diane said. Share with us your tips! Want to share your expertise in decoration preservation? Let us in on your secrets on our Facebook page or tag us on Instagram. Get started collecting vintage teacups with this basic guide. It all started innocently enough. We needed some props, so I popped into a vintage shop downtown to see if I could pick up a few cute vintage teacups. The prices surprised me – $25, $30, even $50 or more for a single cup and saucer? I could buy a whole tea service at Home Goods for that much. My only purchase that day was a $12 tea cup with a saucer that had been repaired – good enough for a prop, I figured. Flea market visits resulted in a few more select purchases, but they were obligatory – pretty enough to use for work, but nothing that got me excited about collecting. That changed when I found treasure at Goodwill. I almost overlooked the pretty cup and saucer, hand painted with violets. 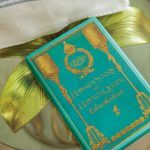 I flipped it over to check the price and saw, to my surprise, the magic words “Haviland Limoges” and a price of just $4.99. Something inside me stirred. I checked all the shelves again and found nearby another cup and saucer, this one with a familiar pink and red rose pattern, similar to one I’d bought at a flea market recently. But whereas that one had been produced in China, this one said “bone china” and “Made in England.” The price on this one was just $3.99. I was hooked! 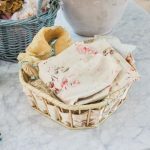 For me, it’s not about the cups themselves – I could easily find dozens of beautiful tea cups at my local vintage shops, if I was willing to pay their prices. But I love the thrill of finding the unexpected treasure for a bargain price. Bit by bit, my collection of tea cups and saucers is beginning to grow, and I love the feeling I get when I find something new. I can’t in any way proclaim to be an expert on tea cups or china, but here are some of the basics I’ve picked up so far. Above all, buy what you love. Tea cup collecting isn’t something to go into as a money making scheme. Choose cups with shapes, patterns and colors that delight your eye and thrill your soul when you see them displayed in your home. Porcelain is a technical term that refers specifically to a type of hard clay (kaolin clay) only found in China. When fired at intense heat, it has a glassy or translucent surface and is very delicate. Various European craftsmen tried to replicate this product with different kinds of clay to various success, including those from Limoges, France. Bone china is made by mixing bone ash in with the clay, a process that was invented by Josiah Spode in England in the 1790s. It is stronger and whiter than porcelain, and therefore became very popular throughout Europe. While it may seem of little practical difference, there are technical differences between coffee cups and tea cups. Tea cups tend to be smaller, more delicate, more ornate and their handles are higher on the side than coffee cups. You can also find demitasse cups in many patterns and styles. 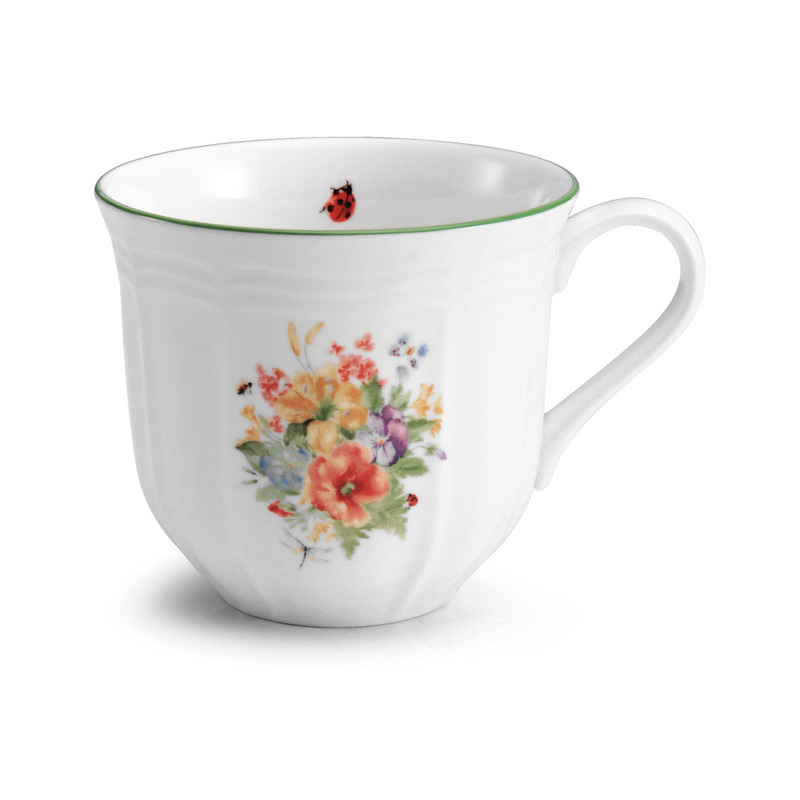 Most tea cups will have a mark on the bottom that indicates their country of origin and the company that produced it. It might even include the name of the pattern and the date it was produced. You can use online resources to help you track down information about these marks if you’re interested in knowing more. When buying a teacup and saucer set, check carefully to make sure they are an actual match – don’t just compare the pattern, but look at the mark on the bottom to ensure they were produced together. A mismatched set should have a reduced price. On the other hand, many people enjoy the charming novelty of mismatched cups and saucers. If monetary value isn’t an issue for you, then feel free to mix them us as desired! Take a break this busy season in space decorated just for you. As the days grow shorter and colder, having a comfy chair next to a sunny window can provide a lovely place to warm your toes and your heart. As evening approaches, the glow of the tree twinkling along with the stars marks the end of each full day. The hustle and bustle of the holiday season is blowing in like a cold winter’s breeze. There is so much to do in a short window of time. 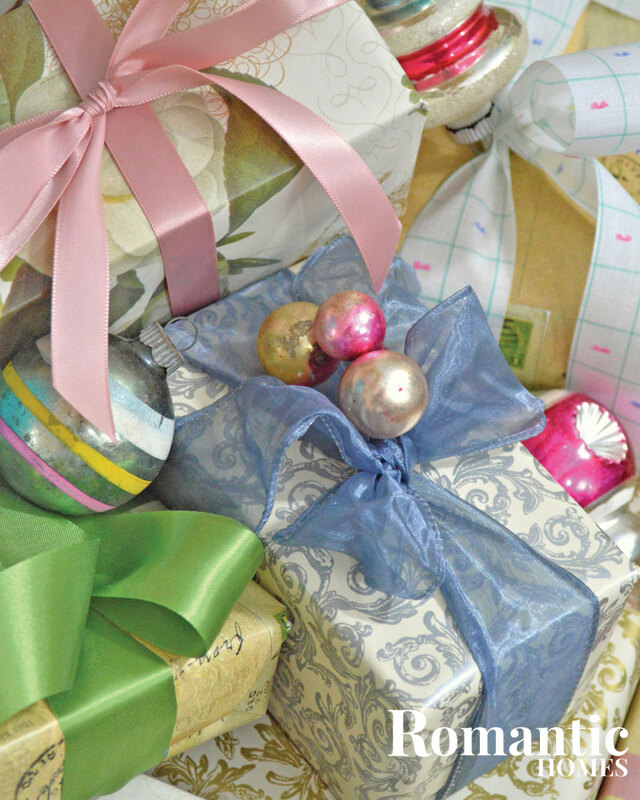 Contrary to popular believe, wrapping presents can be fun and inexpensive. Use mix-and-match papers and add ribbons in cheerful colors; then add a special touch like a small ornament to the package. For many people the holidays pass so quickly and with so much chaos that the enjoyment is all but lost. Why not try a new approach this year? Take time to find joy in each and every day. Planning is a big part of making the process more enjoyable and less stressful. Slowing down does not mean accomplishing less. It allows time for reflection and peace during a season that never seems to stop. One homeowner has carved out a peaceful spot in her home, a holiday haven where she can plan for the upcoming holiday events as well as take in all the season has to offer. A diminutive antique writing desk is hiding in the corner behind the tree. It is a quaint spot to sit and write holiday greetings to friends and family. There must be a place in your home where you find peaceful solitude. This cottage-style home has a small sitting room tucked into the top floor of the house beneath the sloping roof. This space may be small in size, but it has an abundance of character. A few select furnishings were needed to fill the space. Mix-and-match thrift shop finds were brought together to make the suite complete: a down-filled wingback chair, a small antique desk, a loveseat and a coffee table. This sitting room doubles as a makeshift library, with gardening books stacked all about as part of the delightful décor. 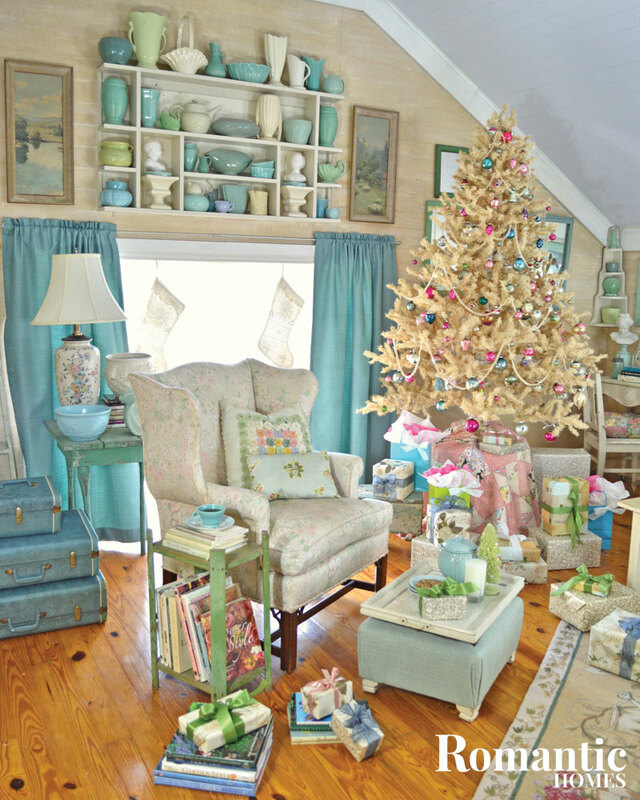 It is common practice in this home to decorate the sitting room first, long before the holiday festivities ever begin. Collecting vintage ornaments is a year long affair. Scour thrift shops, garage sales and auctions for wonderful old beauties. The variety is simply mind- boggling. Transitioning into the holiday season can feel like a burden when life is already hectic. But decorating this small and personal room first helps the family get into the holiday spirit. 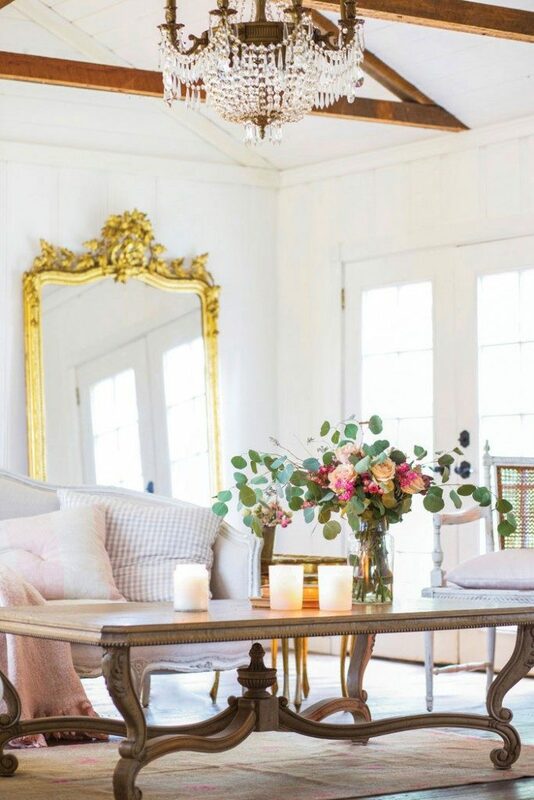 This cozy sitting room provides a great place to plan out the hectic months ahead, and it also is the perfect spot to sit and reflect at the end of each day. One easy way to make a plan is to create a schedule. First, mark the calendar with important dates and events. Then fill the days with things that bring joy: making wreaths, baking cookies and reading Christmas stories. 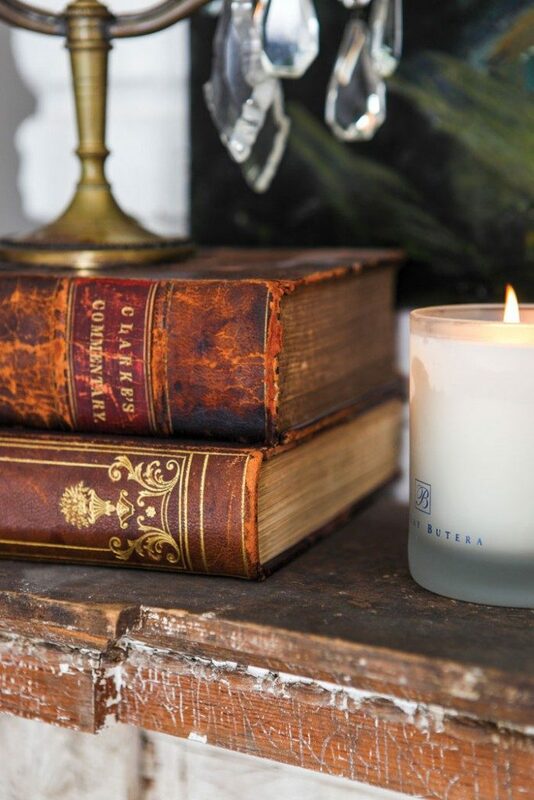 As each day passes, retreat to your cozy corner to reflect on the day and look ahead to what tomorrow’s schedule holds. Decorate your home with enthusiasm and purpose this holiday season. First look for inspiration. Get motivated and find a cozy corner you can dress in festive fashion. 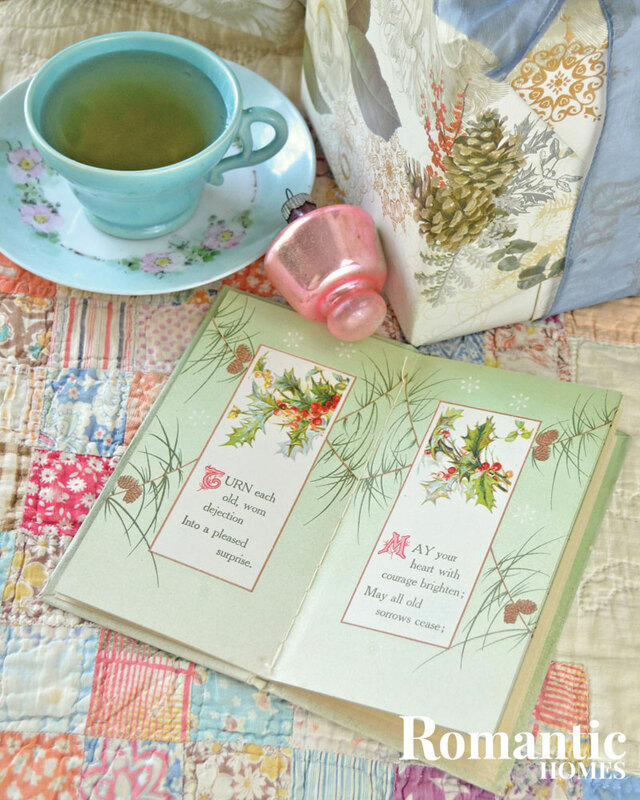 Holiday ephemera are not only fun to collect for their inherent beauty, but old pieces like books filled with holiday adventures are delightful to read throughout the season. 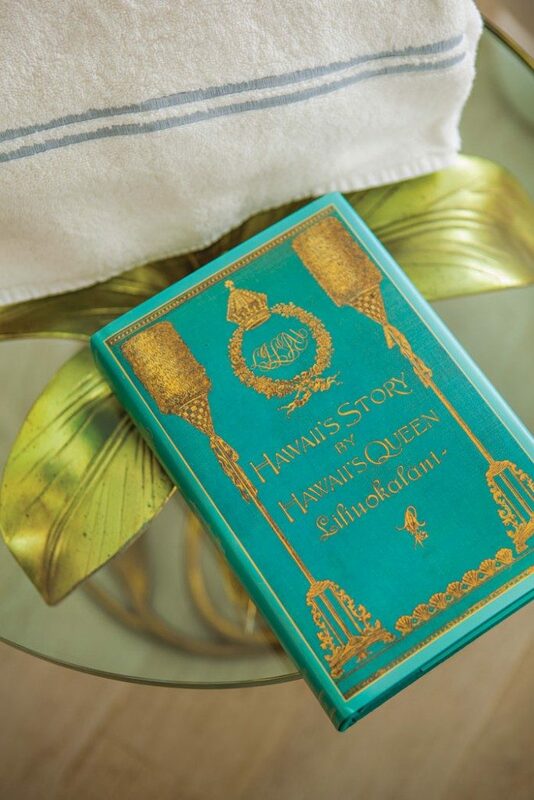 Reading a story or two can be a tremendous source of holiday inspiration. Next, make a schedule by filling a calendar with everything you hope to accomplish in the months to come. Lastly, find a few moments at the end of each day to sit and reflect in the glow of the holiday’s twinkling lights. 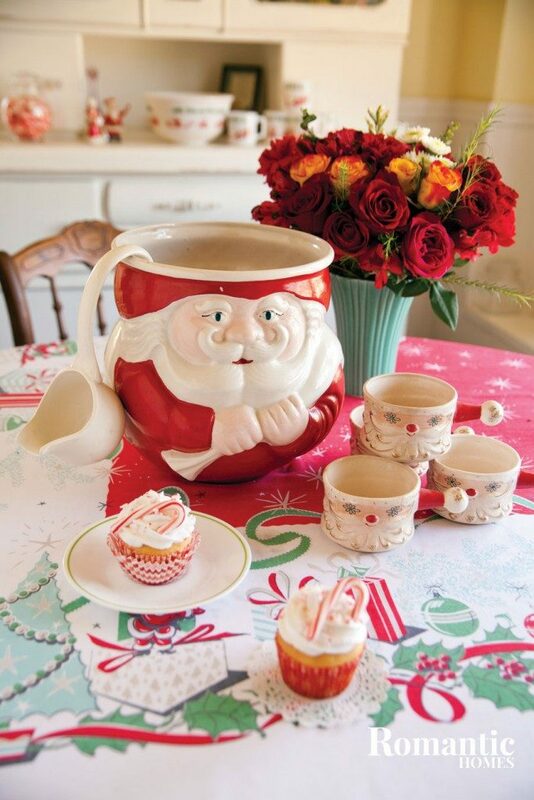 Fill your home to the rafters with holiday décor that makes you smile. Enjoy the season to the fullest and make it your own by surrounding yourself with delight. The joy will be contagious, so don’t hesitate to share. 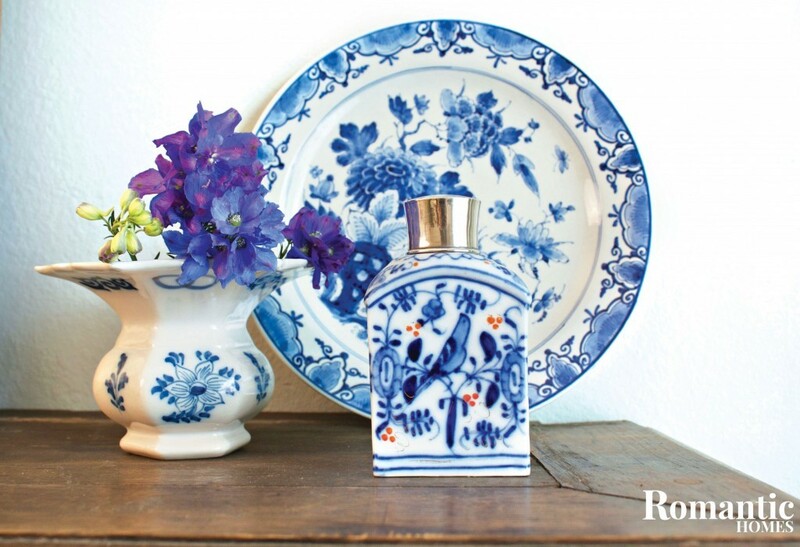 Delft blue and white pottery is a beautiful and collectible addition to your home decor. 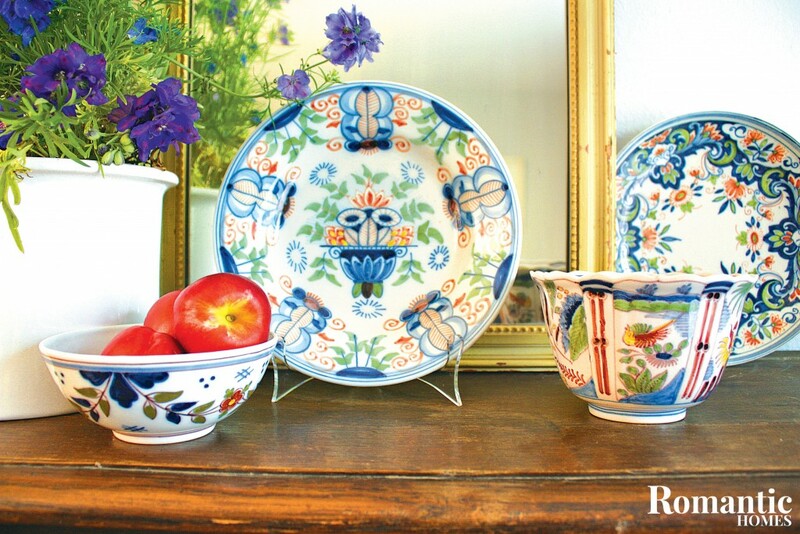 Do you admire Chinese porcelain, but scared it will clash with your country cottage? The Asian pottery’s European cousin might be the answer to that empty fireplace mantel begging to be decorated. Delft pottery, also known as Delfts Blauw, is the Dutch successor of China’s iconic blue and white porcelain. Instead of porcelain, Dutch Pottery was manufactured from earthenware clay. Europe fell in love with the porcelain coming in from China when the Dutch East India Company began to import it. Dutch potters decided to mimic the pottery beginning in the 16th century, but swapped the porcelain material for a less expensive clay called earthenware. A colorful version of Delftware was also produced that featured muffled reds, greens and yellows; the enamels were labeled polychrome Delft. The Delft Blue and Makkum earthenware were shaped into urns, decorative plates and vases that featured hand painted art. Instead of dragons, cranes and Chinese architecture, the Dutch painted florals, birds and Dutch scenery for a more European touch. The counterpart to the famous blue and white pottery is Delfware that is made out of toned-down enamels known as polychrome Delft. This new art form was not just limited to the classic plate. Tiles were particularly popular amid the spectrum of Delftware, and 400 factories in Holland produced Delftware tiles during the “golden age.” Now, only three factories—the Royal Delft, De Delftse Pauw and Royal Tichelaar Makkum—manufacture the pottery. Look for the underglaze marks. Factories hand painted these marks. Don’t shy away from a few chips. 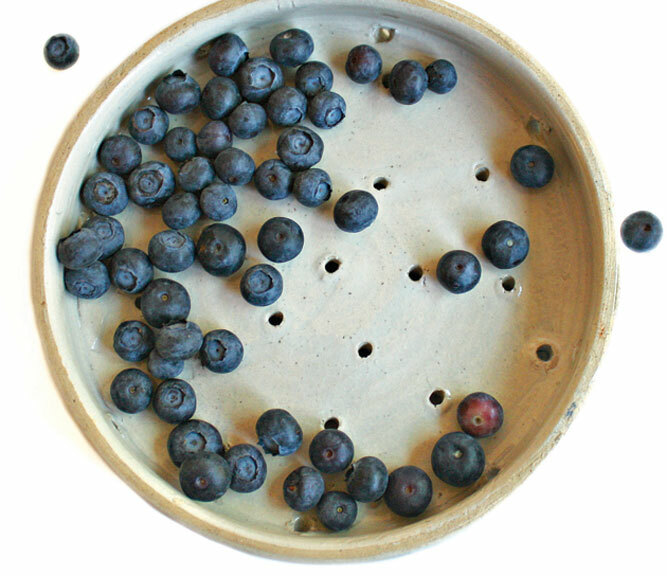 A chip in a Delftware piece shows it is genuine. Examine the design. An intricate and precise painting means that a real Dutch hand from long ago handled the pottery. The stranger, the better. Hold on to it if you find a more peculiar piece like a tea canister, cow figure or cruet set. Unlike tiles, these pottery antiques are harder to find and therefore have a higher value. 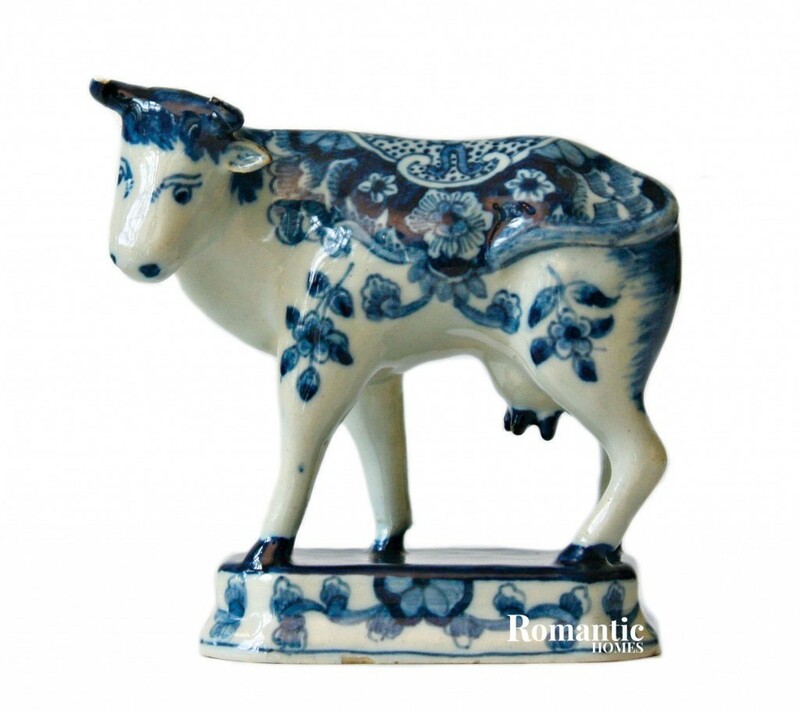 Quirky pieces like this cow figurine are rare and valuable.